The cemetery was laid out in 1840. The lodge shown here was originally described as a chapel, and it is referred to as such in the advertisement that is reproduced at Link (at Canmore). The building stands by the entrance gates, which are at the eastern side of the cemetery. For more information on the cemetery itself, see NS6067 : Sighthill Cemetery. Both the lodge and the gates were designed in 1839 by John Stephen (of Scott, Stephen & Gale). See also NS6067 : Sighthill Cemetery, where the gates are shown, with the lodge behind them. For an architectural summary of the building, see the following listed building report: Link (at Historic Environment Scotland). 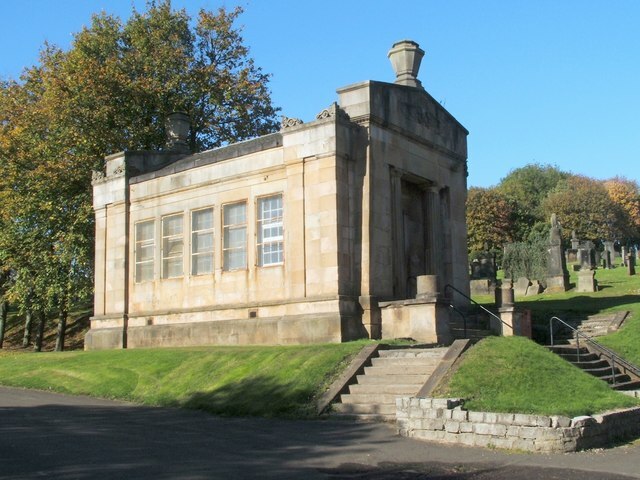 The lodge (1839) is styled to resemble a temple, and stands beside Springburn Road, at the eastern entrance of the cemetery. The cemetery was laid out in 1840, under the guidance of Mr Stewart Murray, on twelve acres of land; it has been extended since then. Originally, plots were sold by the Sighthill Cemetery Company Limited, who owned the land and the cemetery; however, that company went into liquidation in July 1954, and the cemetery subsequently came under the control of Glasgow Corporation (forerunner of Glasgow City Council).